Motorola has gone to great lengths to let the world know its newly-announced Moto X phone is more American than Bruce Spingsteen in Old Glory boxers, eating Apple pie and watching baseball on 4th July. The device has been conceived, designed and built in the good old US of A and will be customised by fashion-conscious American buyers on the AT&T network. 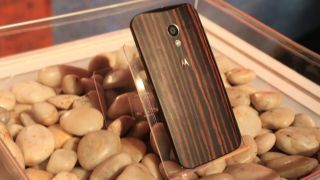 Sadly, its so American that Motorola isn't letting anyone else in the world get their hands on the device. As you may have gleaned already from our extensive coverage so far on Thursday, Moto has "no current plans" to bring the device to Europe, which obviously means the flagship device is out of Brits' reach. The company said it remained committed to Europe, but it seems those on the other side of the Atlantic will be waiting a while longer to see the first evidence of Motorola as a Google company. "We are firmly committed to building a portfolio of products in Europe that show the best of Motorola as a Google company, but at this time don't have any immediate plans for Moto X to come to the region," the company said, in comments that were part of our original report. "Europe remains an important market for us and we have exciting plans in the works. Although we can't reveal specifics right now, this is just the start." In many ways we feel a little ripped off after getting so excited about the Moto X and what it might offer in terms of specs, software and customisation options. However, in fairness, Moto made clear from the very start that the focus would be on the phone's "Made in the USA" status, so it's by no means a huge surprise. It doesn't make the launch of the phone any less interesting from an enthusiasts point of view either. Moto has pulled away from high end specs in favour of personalised design. Could this be a sign of things to come? Check out our early 'knee jerk' verdict in our TechRadar reacts column.